This week’s pick is PDF to Word by Cometdocs.com Inc. PDF to Word is an application that makes it possible to turn all your PDF texts, forms and tables into editable Microsoft Word documents. 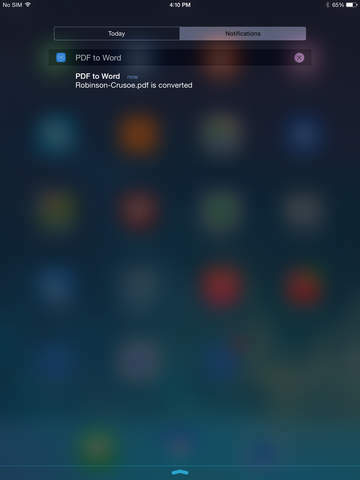 Once you import and open your PDF from within the app it is sent to servers that quickly convert the document. Off-site conversion is necessary for two reasons–to keep your device from being slowed down by the process, and to allow for quick conversion on dedicated servers. When the process is complete, the new file is downloaded to you iPad. -Word documents are optimized for fast viewing and reuse. -Scanned and complex PDFs can be converted as well. -The converted document is in the .docx format and immediately ready for further reuse. -Layout, formatting, tables, images and text look exactly like the original. -No need to further fix the converted document. Although PDF to Word works as advertised and takes the task of turning PDF texts, forms and tables into editable Microsoft Word documents, the free version is not for anyone in a hurry. However, for a one time $4.99 upgrade fee, you can take that down time of 1+ hours, and turn it into an immediate conversion–for life! The conversion process is almost too easy. Select your PDF document on your iPad or iPhone and use the sharing feature to open it in PDF to Word. Depending on the method you chose–free or a lifetime of immediate conversions, your file will now be a editable Word document. 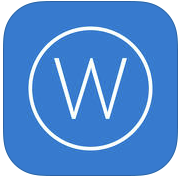 Here’s an App Store link for PDF to Word. Compatible for both the iPad and iPhone, you need to be running iOS 6.1 to take advantage of this utility. You can download it today for free, or pay $4.99at any time thereafter for a lifetime of conversions.